If anyone deserves a well-crafted and considerate biopic from Hollywood, it’s Tupac Shakur. The rapper, whose life story has risen to the stuff of legend, is in serious need of his own film. Tupac was full of intelligence and dark charisma, and his passionate lyrics were sharp enough to cut through the thick fog of mid ’90s competition as he brought a hard-edged originality to West Coast hip hop. He was a singularly interesting and multi-faceted figure, and it’s almost sacrosanct that his story is depicted on film the right way. 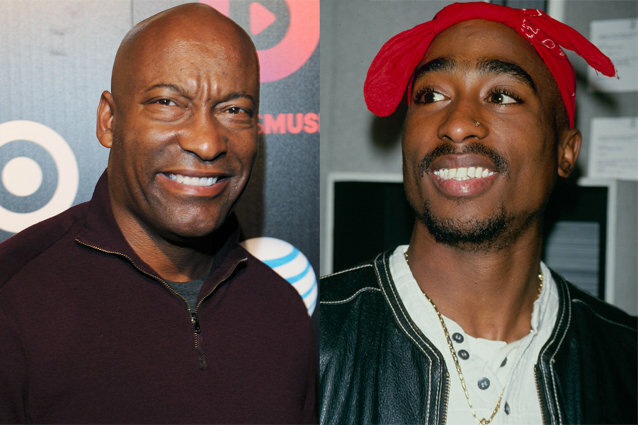 Now, director John Singleton has stepped up to the task. The filmmaker, who actually knew Shakur personally after directing him in the 1993 film Poetic Justice, is set to helm the long-awaited biopic. Singleton, who was originally linked to the project back in 2011, has inked a new deal to rewrite, produce, and direct the film. The task of bringing Tupac’s story to the big screen is not one for the faint of heart, and there are several ways that such a touchy project could go seriously wrong. Since his death, Tupac has become nothing short of a mythic figure in the music world, and there’s a load of pressure weighing on Singleton brining his story to the big screen just right. Here are the thing’s that the director would need to focus on in order to create a great Tupac biopic. Tupac Amaru Shakur, whose name originates from a Peruvian revolutionary that fought for his freedom against Spanish rule, has an incredibly interesting childhood. While most biopics would do better to steer away from focusing on the entire life of their subjects Tupac’s early life is actually quite fascinating and the story would actually flourish from spending at least a little time examining the rapper’s beginnings. Tupac’s parents, Afeni Shakur and Billy Garland, were both high ranking members of the Black Panther Party, and just a month before Tupac was born, his mother was acquitted of charges against the United States. Tupac’s stepfather, Mutulu Shakur, spent time on the FBI’s Most Wanted list, and was imprisoned for planning an armored truck robbery for the Black Liberation Army. His parents’ controversial political affiliations and ideologies clearly trickled down into his music, and that influence is worth a mention, even if it’s a quick one. Even though his life outside of his lyrics almost threatened to overshadow his music, Tupac was primarily a musician when all was said and done. The man himself is a legend, but it was the music that burrowed its way into our hearts and minds. A big focus of the biopic needs to be dedicated to recreating the his music respectfully. We should get a glimpse at Tupac’s creative method, and witness the genesis of his biggest hits, and most noteworthy songs. Singleton only needs to look towards 2005’s Hustle and Flow to see how to really capture hip hop’s creative process in a truly affecting way. It may be obvious to say, but a large portion of the film should focus on the deadly rivalry that brought Tupac’s life to an end. The music feud that escalated from verbal jabs in song lyrics to real violence that spilled it’s way onto the streets was hip hop’s darkest hour, and should be given it’s due reverence. Tupac’s death, and the later death of his chief rival, The Notorious B.I.G., changed rap music and music in general forever. the complicated and intriguing story needs to be heavily examined. During the early to mid ’90s, The East Coast/West Coast rivalry racheted up a couple dozen notches after Tupac was shot by unknown assailants at Quad studios, an attack that he believed to be orchestrated by Sean “P.Diddy” Combs, Biggie, and other members of Bad Boy Records. Because of this and other events, Tupac was incredibly paranoid in the last few years of his life, and these feelings seeped their way into the lyrics of his songs like “Hit em Up” and “Hail Mary.” We should see that paranoia play out on screen in Tupac’s depiction. For all his talents, Tupac Shakur was still only human at the end of the day. He was deeply flawed man and his brushes with trouble, including constant and pervasive legal issues, an alleged sexual assault, various physical altercations, and the mysterious shooting of a six-year-old, are all a part of his legend. In order to tell a truthful tale about Tupac’s life, Singleton shouldn’t gloss over the more unpleasant details. It would be doing him a disservice not to highlight the messier parts of his history.